Using an LTO cleaning tape to keeping drive heads clean is essential if you want to maintain performance and data integrity. 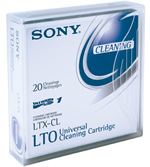 The Sony LTO cleaning tape LTX-CL is designed exclusively for use with all LTO drives and autoloaders running UCC-compatible firmware. It provides around 50 cleaning's for IBM Full-Height and Quantum drives and 15 cleaning's for Hewlett Packard drives. The LTO cleaning process can be set using two methods the first being that the drive will alert you, alternatively, you can set this within your backup software and it will automatically perform the head clean every so many tape passes.